← Confessions Of A Bookaholic: Guilty Pleasure Edition #17 – Sweet Valley High Super Edition #4 “Malibu Summer” – The Prettiest Super Edition Of Them All! Clary Fray wishes her life would go back to normal. But it is hard to find ‘normal’ when you’re a demon-slaying Shadowhunter, your mother is in a magically induced coma and all of a sudden you see werewolves, vampires and faeries wherever you go. Still reeling from the realization of who her father is, the big bad Valentine, and that her brother is alive (you know him as Jace) Clary would like nothing more than to pretend it was all a dream and hang out with her best friend Simon. But when the second of the Mortal Instruments is stolen, things start to happen – quickly. The dreadful Inquisitor is called and suspects Jace has secretly pledged his allegiance to his father, Valentine. It soon becomes clear that war is coming, and they have to stop Valentine before he unleashes hordes of demons on Earth to make way for a new reign of Shadowhunters, one under his complete control. The stakes have never been higher and Clary and the gang must band together, but can they trust Jace? Would he really be willing to betray everything he believes in to help his and Clary’s father? The second installment of “The Mortal Instruments” series may not completely fill the shoes of the first book, but it makes coming close look magnificent. This book picks up not long after the last book ended. Clare’s greatest strengths in the first book are just as solid in this one. The characters are distinct, each with hundreds of layers. What I love is that while these characters can keep you guessing, everything they say or do rings true to who they are at their cores. Obviously, Clare knows her creations intimately (as a writer should). They grow and adapt to their experiences in the last book, and you see that growth in this book. You even see it when it comes to things that happen in this book. The pace is also just as fast. In a book of 453 pages, there weren’t any lulls or times that I felt were boring. As more of Valentine’s endgame is revealed, the showdown is just as dramatically satisfying as the showdown in the first book. And when it comes to endings, Clare rocks it. Just like in the first book, Clare brings enough closure to feel satisfied with this ending and yet enough open to make you anxious to tear into the third book. I love that she doesn’t employ the same tactics to pull this off either. Clare is a master of making sure you want more. I don’t know how she strikes the balance between open and longing and satisfying closure, so flawlessly, again and again, but she does. And it is certainly appreciated. There were two other things that left me with mixed feelings. The first, is not so mixed as it is almost disappointed (or even slightly disappointed), is that Clary seemed to lose some of her edge in this book. She was never a damsel and is still spirited and brave, but I didn’t like how this book did not leave her more vulnerable as the first one did, and yet she seemed meeker in this book. She even needs to be rescued in the end. This bothered me for some reason. I have always been one who didn’t want to be rescued, but would rather be admired for my strength. I recognized this in Clary in the last book and it was one of the ways I felt connected with her. I don’t think she is any less strong in this book, but I am not sure if I believe she (the character) agrees with me. The second thing is that one of my favorite characters died in this book. I don’t know how I feel about that. In a world of demons, spirits and magic dead does not mean gone and this character is still around, but in a new kind of way. If the character was gone, I would be pissed, but they’re not. I fancied the humanity of this character, however, and that no longer exists because, hello – dead. Every character in this book is more or less human (yes, even Shadowhunters themselves are technically human, just special, which means yes it may have been a Shadowhunter who gets it – you’ll have to read the book) but nothing is sugarcoated. Humanity is as beautiful as it is flawed and Clare emphasizes both in her characters. I hope this death does not mean this character’s humanity will be less of what it was. I know this character was killed deliberately to advance the plot, the character or both, so I am trusting Clare to help me be less uneasy about it and accept that death does not change a character I grew so fond of. If you pick up this book (and you should) there is a good chance you’ll finish it in a single sitting. It’s thrilling, funny and will keep you turning the pages until you reach the end, but if you haven’t read the first book yet start there. You don’t want to deprive yourself of that beautiful discovery! 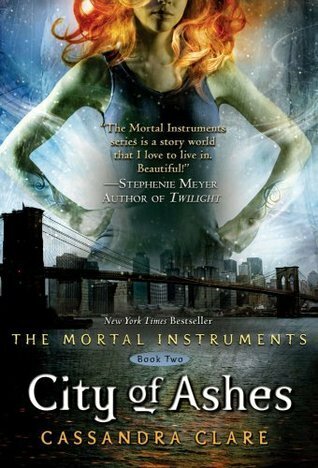 This entry was posted in Book Reviews, Books, fiction, review and tagged "book review", "city of ashes", “Cassandra Clare”, “City of Bones”, “doomed romance”, “forbidden love”, “love triangle”, “Mortal Instruments”, Angel, demon, fantasy, Nephilim, novel, shadowhunter. Bookmark the permalink.